Developing adequate power supply for Africa is one of the great challenges of our time. The climate agreement in Paris in December at COP 21 makes clear the global consensus that our energy future needs to be green and sustainable. Renewables are the way forward and can compete at market prices. In telecoms, Africa has managed to skip a generation of development and has gone directly to mobile networks. The same can be done for renewables. Africa can develop its energy resources without having to make investments in older forms of power generation and grids. Despite increases in generation capacity, sub-Saharan Africa is the only region in the world where the number of people without access to electricity is set to rise, from less than half the population today to more than two thirds in 2030. If current trends continue, billions of people will be denied access to a better quality of life. Renewable energy is uniquely placed to provide solutions to Africa’s energy challenge. Wind and solar are not only carbon free, but they are scalable, easy to install and appropriate to today’s level of technology. In a number of countries solar energy is now cheaper than wind on high radiation sites, which in turn is cheaper than gas, which is cheaper than new coal, which is cheaper than oil. All are cheaper than new nuclear. 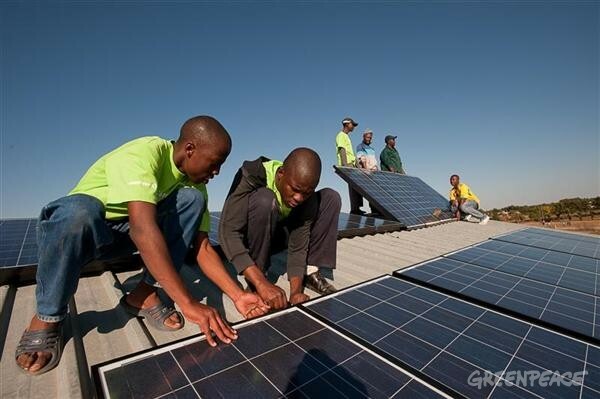 In South Africa, new onshore wind is already half the projected cost of new coal power. Over the past five years, the cost of wind has come down by 55 percent, while solar has fallen by 80 percent. This is the classic J-curve at work. It is a product of economies of scale, greater efficiency and, of course, breakthroughs in technology. In the case of solar PV every time global production doubles, unit costs fall by 24 percent. It is analogous to Moore’s Law for the microchip. We are not yet at the bottom of the downward cost curve for renewable energy technologies. In their report published to coincide with the Copenhagen COP summit in 2009, the IEA predicted that there would be 20GW of solar PV installed in the world by 2015. The actual figure is 180GW. Wind has enjoyed a similar trajectory, far outpacing official predictions, as costs have fallen. Not only are wind and solar energy now cost competitive with fossil fuels, but the cost of fossils is rising even at a time of weak global demand. Transitions towards renewable power in South Africa, in Chile, and in many other countries are remarkable, given that coal and gas generators in many countries are not yet paying a carbon price for their generation. Now, under the global agreement signed at COP21, the world looks set to increase the pace of progress towards adequate carbon pricing. The Chinese have already chosen carbon pricing as their primary policy instrument for reducing carbon emissions, as the EU did a decade ago. So have many US cities. When the price of carbon reaches $32 per tonne, as it inevitably will by 2030, the game will be finally over for fossil fuels. In 2008, I founded Mainstream Renewable Power to develop wind and solar generation in Europe, the Americas and Africa. One of Mainstream’s founding objectives was to develop renewable energy in emerging markets, recognising that the world was on a one-off transition to sustainability. We have now delivered three of Africa’s first large-scale wind and solar plants in commercial operation in 2014, while establishing ourselves as the leading developer of renewables projects in South Africa. We are also bringing forward a further 1,100MW of generation capacity across Ghana, Egypt and South Africa with additional projects in a number of other countries. Wind and solar energy are supplying low-cost, low-carbon, and highly reliable generation today. They are already generating the electricity that will power the cities, homes and businesses of tomorrow. Africa has a clear sustainable path to its energy future. It is one where wind and solar energy will deliver affordable and dependable electricity across the continent on large grids and micro-grids, in large cities and in small rural villages. In the not too distant future, people will wonder why we ever did anything else. Eddie O’Connor is the CEO of Mainstream Renewable Power.